Former UN chief and Nobel peace laureate Kofi Annan died Saturday at the age of 80, triggering a flood of tributes from around the world for the “diplomatic rock star”. UN High Commissioner for Human Rights Zeid Ra’ad Al Hussein said Annan was “a friend to thousands and a leader of millions”. The UN said it would fly flags at half mast at all of its locations around the world through Tuesday. In 1993, he took over as peacekeeping chief — a position he held through two of the UN’s darkest chapters: the Rwandan genocide and the Bosnian war. Annan later admitted the scandal had sorely tested his mettle not only as secretary-general, but as a father. He also set up his foundation devoted to conflict resolution and joined the Elders group of statesmen which speaks out on global issues. But he had recently spoken of his despair at the state of global leadership and the lack of will to engage in resolving crises. 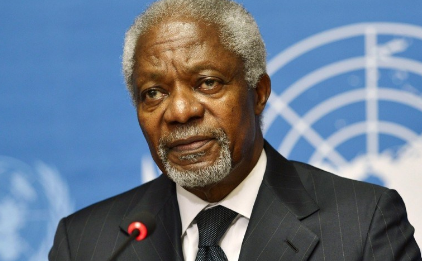 Despite his criticism, current and former world leaders voiced their admiration for Annan. President Donald Trump had yet to comment, but the US ambassador to the UN Nikki Haley said Annan “worked tirelessly to unite us and never stopped fighting for the dignity of every person”. Next articleThis Udacity Graduate Has A New Artificial Intelligence Career!